Play the music? Check! Light the lights? They did, indeed! And for the first time in 12 years, we meet the Muppets, both old and new, on the big screen! As a lifelong fan of these delightful creatures, I had been anticipating the release of The Muppets for quite some time. Let me tell you, folks – it did not disappoint. The film is a perfect blend of everything the Muppets are about and what they can mean to a new generation of viewers, who will be powerless against their charms. I entered the theater expecting strong emotions, and as “Rainbow Connection” swelled over a theater full of delighted faces, I completely lost my composure and cried. It was a perfect moment. Actor Jason Segel (who plays Gary) is a lifelong Muppet fan and does exactly what he set out to do in this film: introduce a new generation to the Muppets and remind older fans of what a special place the Muppet universe is. The Muppets live in their story but are also aware of the camera and audience, erasing the fourth wall and inviting us to join them. 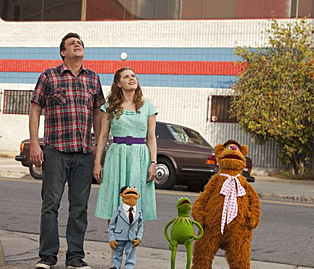 In their world, the Muppets mix with human beings (including random celebrities!) and they’re just as much flesh and blood. Gary and Mary (played by the ever-charming Amy Adams) join a delightful new member of the Muppet family, Walter, on a trip to meet his idols, the Muppets. Walter is an adorable little orange fellow with funny hair and a dream. For newer fans, he’s a guide through Muppet history and fandom, giving those less familiar with the characters a crash course in their former glory. Walter’s wide-eyed wonder at these characters can’t help but endear them to younger viewers. On what is supposed to be an anniversary trip for Gary and Mary, the trio wind up at Muppet Studios Los Angeles, only to find the place in ruins with a very grumpy, disinterested Alan Arkin as a tour guide (Arkin once hosted the Muppet Show, and his appearance in this movie is just another instance of a complete disregard for the fourth wall). Wanting to see more, Walter slips away to Kermit’s old office, only to overhear the evil plot of Tex Richman (played by the deliciously evil Chris Cooper). 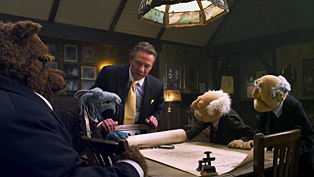 Richman (who is unable to laugh) is aided by his henchmen, the classic Muppet Uncle Deadly (from the Vincent Price-hosted episode of the show) and new-gen favorite Bobo, in plotting to tear down Muppet Studios and drill for oil (which he assures the audience is there). Walter must race to find the Muppets, explain the plot and raise ten million dollars in order to save not only Muppet Studios, but the Muppet name itself! Through music and montage, and aided by my new personal favorite Muppet – Kermit’s butler, ’80s Robot – the team is rebuilt with many a hiccup and explosion along the way. But even with all of them together and putting on a whole new show, raising $10 million in one night is a very tall order. Can they do it? Hell, I’m not going to tell you – go see the damn movie, you goon! The inclusion of these characters helped reinforce the feeling that this isn’t a story about a frog, a pig, a bear and a whatever amidst a world of humans but rather the story of a world where creatures of all kinds exist – great and small, sane and insane. I’m glad that The Muppets was able to capture that. Hopefully, the film will pass that feeling down to the new generation of viewers, who will no doubt adore these characters.